During the Friday, January 26th TPV Developer meeting, mentioned was made of cloud texture sets produced by Australian photographer Stevie Davros, which he offers for sale through the Marketplace. Curious, I decided to go and take a look and have a play. In all, Stevie is offering five sets of cloud textures at prices ranging from L$99 through to L$599. These are essentially collections of .TGA files designed to replace the cloud texture found in the viewer, and a selection of associated windlight sky .XML files specifically designed to work with the cloud textures, together with comprehensive set of installations instructions and links to his installation videos. To help people understand how they work, Stevie provides a sixth demonstration set for free. A link to a Dropbox file location where the actual files for installation can be downloaded. A link to a YouTube slide show of the various cloud textures. A link to his set of Flickr albums showings the cloud images. Assorted links to windlight tutorials. On receipt of a note card (delivered to your Received Items in its own folder), simply copy / paste the Dropbox link into your web browser to display a preview of the download ZIP contents (thumbnails of the folders and instruction files), and click the Download button, top right of the web page – don’t download the individual files. A choice of folders with the cloud .TGA files – one for PC, one for Mac OSX. These are intended to replace the default cloud texture provided in the viewer. A folder of .XML windlight files that can be used with the cloud textures. Copy the contents of this folder to your viewer’s user windlight skies folder, rather than the viewer’s main windlight skies folder. Installation instructions in .PDF and .RTF. Two images used in the installation instructions. For most viewers, using the different cloud textures requires renaming the texture you wish to use via your computer’s file manager, and restarting their viewer. Again, Stevie’s installation instructions explain what is required. If you use Firestorm, you can simply copy all of the cloud textures to the viewer’s windlight\cloud folder and select your required cloud texture from the Preferences > Windlight > Cloud Texture drop-down, although a viewer restart will still generally be required to apply the change. Note: when re-logging after selecting a custom cloud TGA, you may see no change in your sky if you are in a region using the default sky settings, or things might look initially messy. If this happens simply switch to a suitable windlight setting – see below. There are a wide variety of ways to access windlight .XML files depending on the viewer you are using. Within the official viewer, windlights are access via the World menu > Environment Editor and then using either the Environment Settings panel or Sky Presets > Edit Preset floater, using the drop-down on each to select your preferred windlight setting (see below). The JuliaSet clouds have set of associated .XML files with the prefix ~Clouds_JuilaSet_[name]). Some of the cloud textures can look rough – faint rings may appear in the sky, the texture repeats might have a definable edge, etc. These issues can generally be corrected by adjusting the amount of cloud cover using the appropriate slider (e.g. 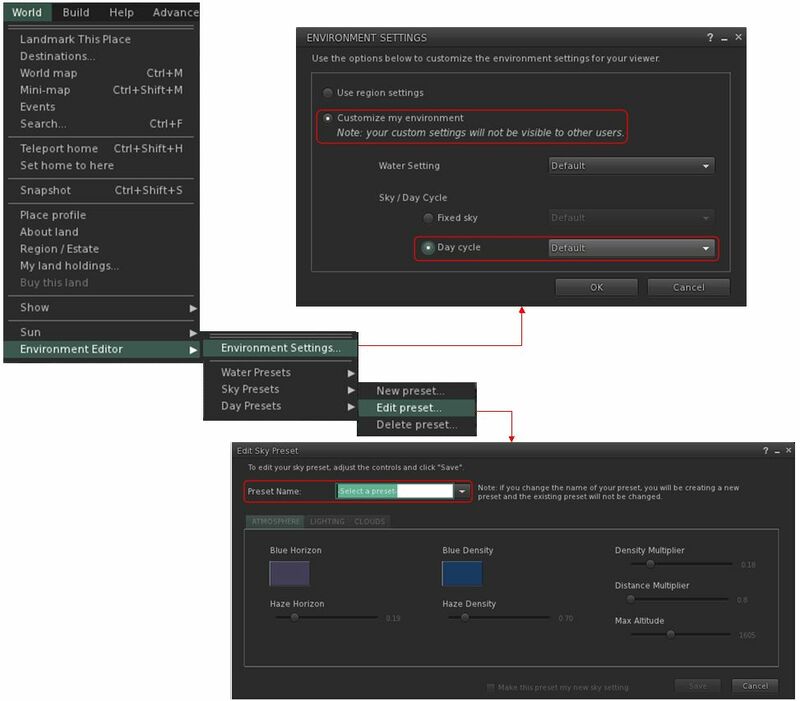 World menu > Environment Editor > Sky Presets > Edit Preset … > Cloud tab) and use the coverage slider to adjust as required. The cloud .TGA files are copyrighted by Stevie Davros. As such, although they are supplied outside of Second Life, they should be regarded as supplied under the following permissions: Copy, Modify, No Transfer, and so should not be passed to other users. These sets are intended to be applied on the viewer side only (the cloud .TGA files can only be applied on the viewer-side), so only you will see them in operation when applied (those with their own region / with EM rights, might apply the windlight .XML files to their region). It is perhaps also worthwhile pointing out that Rider Linden is working on the Environment Enhancement Project (EEP) – read this overview about the project for more. The point of this is that some might prefer to see how this project is implemented – testing is due to start on Aditi very soon – before purchasing sets of clouds. Brilliant WL settings! Checked out Stevie’s flickr page and my mind spun – they’re all so incredible. Thanks for covering this, Inara – I’d never have known about it without your informative post. Thanks! I’d actually have missed them if the info hadn’t popped-up in text at the TPVD meeting 🙂 . I’ve extracted each of these files to the appropriate FS folders, but they don’t show up in any of the WL drop down menu’s in-world. Or am I supposed to click on whichever one I want in the actual FS folders before logging in each time? Tech stuff and I don’t get along too well; we give each other headaches. Anya, drop me a line in-world, and I’ll try to help. There might be a little delay in me getting back to you, as my in-world time is a little constrained at the moment, but I’ll do my best to help. Thank you so much for this article. Never would have known otherwise & that would have been a pity because they are gorgeous & add a whole other level of beauty to SL. Hi Inara, a belated thanks for the review. I have been away from Second Life as I was having a new house built and living out of a suitcase in temp accommodation makes access to SL rather awkward 🙂 I am back now, and hope to create some more cloud files soon. If the EEP supersedes my cloud files I will see about integrating them where I can and advise those who have purchased, or I will make the existing packs all free, one way or another. Regards, Stevie.